The Ultimate Scrubber will make cleaning easier. Use to clean kitchens, bathrooms, dishes, laundry, tiles, automobiles, BBQ and more. Use scrubber on all those hard to scrub stains, spots and spills. We feature an adjustable tilt head for easy scrubbing from any angle. 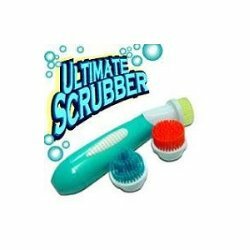 With your help we can reach more people and let them know about Ultimate Scrubber whether this product works or not. Being battery operated there just isn't enough power for this product to work as advertised. It reaches around taps easy enough, but without the power to do any real good.